The experiments were conducted by Shoukhrat Mitalipov and colleagues at Oregon Health & Science University in Portland. 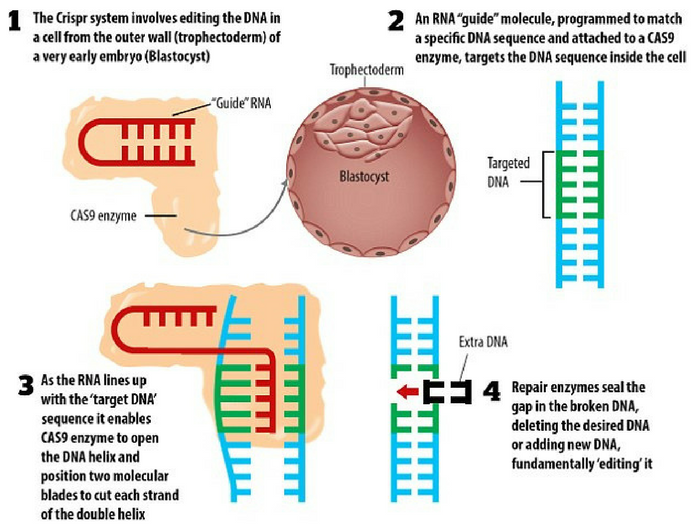 The single-celled embryos Mitalipov edited were discarded after the experiments to ensure they could not become too developed. CRISPR was used by scientists in China in 2015 to edit several human embryos that had severe defects. Like the scientists in Oregon, the team in China discarded the embryos before they could become too developed. The Chinese technique led to genetic changes in a few of the embryos, and in a few cases, CRISPR sometimes snipped out the wrong place in the DNA. Someday – perhaps much sooner than we realize – scientists could use this technique to edit not just the offspring of people with genetic diseases, but their offspring, as well. Theoretically, this could eradicate diseases caused by mutated genes, such as Huntington’s, sickle-cell anemia, Tay-Sachs, and many others. 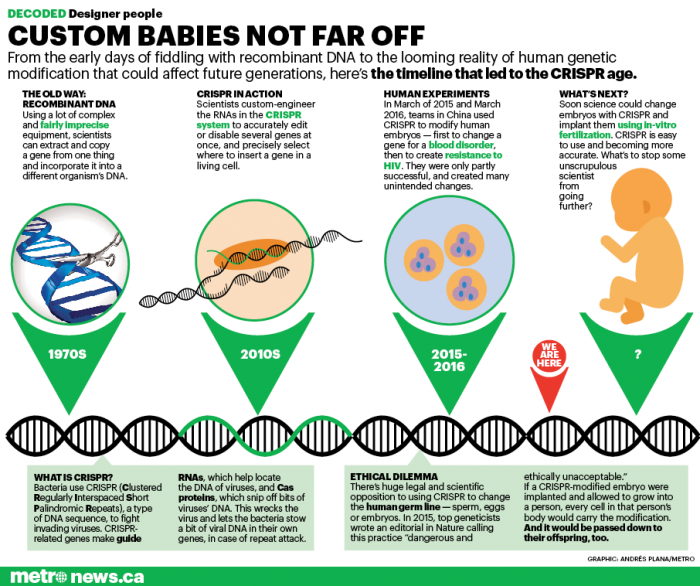 Gene-editing is rife with controversy and ethical concerns. While many say CRISPR-Cas9 will help reduce the occurrence of genetic diseases, Marcy Darnovsky, Executive Director of the Center for Genetics and Society, says there are ways to do that which don’t involve editing the human genome. For example, preimplantation diagnosis (PGD) allows parents to screen embryos for certain disease-causing genes before implanting them via in-vitro fertilization (IVF). However, in cases where someone carries 2 copies of a defective gene, PGD won’t work because all their embryos would also carry that gene. Right now, scientists are supposed to focus their efforts on editing disease-causing genes. But CRISPR could potentially open the door to the creation of “designer babies,” in which parents are permitted to edit their children to be better at sports or math, for example, or to be more physically attractive. He’s not alone in his concerns. Maybe they will be able to fix the jean for poor journalism someday as well.